Russian find suggests Neanderthals died out earlier than was thought. The first humans to reach Europe may have found it a ghost world. Carbon-dated Neanderthal remains from the foothills of the Caucasus Mountains suggest that the archaic species had died out before modern humans arrived. The remains are almost 10,000 years older than expected. They come from just one cave in western Russia, called Mezmaiskaya, but bones at other Neanderthal sites farther west could also turn out to be more ancient than previously thought, thanks to a precise carbon-dating technique, says Thomas Higham, a palaeoanthropologist at the University of Oxford, UK, and a co-author of a study published this week in the Proceedings of the National Academy of Sciences1. The implication, says Higham's team, is that Neanderthals and humans might never have met in Europe. However, the Neanderthal genome, decoded last year2, hints that the ancestors of all humans, except those from Africa, interbred with Neanderthals somewhere. Perhaps humans departing Africa encountered resident Neanderthals in the Middle East. "DNA results show that there was admixture probably at some stage in our human ancestry, but it more than likely happened quite a long time before humans arrived in Europe," says Ron Pinhasi, an archaeologist at University College Cork in Ireland, who is lead author of the latest study. "I don't believe there were regions where Neanderthals were living next to modern humans. I just don't find it very feasible," he adds. Carbon dating of stone tools characteristic to humans and Neanderthals, as well as their physical remains, has previously given the impression that the first humans to reach Europe, between about 40,000 and 30,000 years ago, shared the continent with Neanderthals long established there. However, carbon dating of bones older than about 30,000 years is skirting the limits of the technology, because by that age nearly all of the radioactive carbon has decayed, says Higham. The overlap in dating could also be the result of contamination of older finds with younger material. "What we are finding is that the careful and patient excavation work of many archaeological sites has not been supported by accurate and reliable radiocarbon dating," Higham adds. Previous excavations had suggested that the most recent Neanderthals at Mezmaiskaya died around 33,000 years ago. But using the most up-to-date dating techniques, Pinhasi and his team dated the remains of two Neanderthal infants from the site to around 40,000 years ago. The infants' bones were found above the cave's other Neanderthal remains, so they must be the most recent, says Higham. He is now re-dating other Neanderthal sites, and expects those dates to creep upwards, too. "My gut feeling would be that probably the latest Neanderthals and the earliest modern humans may have overlapped for a bit, but not for too much," says Higham. David Reich, a geneticist at Harvard Medical School in Boston, Massachusetts, says that Higham's conclusion fits with his own team's discovery that all contemporary humans, except those who trace their ancestry to Africa, owe about 1–4% of their DNA to interbreeding between humans and Neanderthals2. 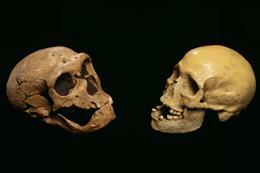 Reich's team did not find any proof that Neanderthals ever mated with the ancestors of modern Europeans specifically. Yet Reich says that new, more sensitive methods for detecting interbreeding, as well as genome sequences from late Neanderthals could change that conclusion. "Absence of evidence isn't evidence of absence," he says. Chris Stringer, a palaeoanthropologist at the Natural History Museum in London, agrees that Neanderthals were rare in Europe after 40,000 years ago — but adds that they might not have completely disappeared. "It does seem that if Neanderthal populations existed after that time, they must have been small and scattered remnants," he says. Evidence for more recent Neanderthal populations does exist. Clive Finlayson, director of the Gibraltar Museum, and his team have dated a Neanderthal settlement in Gorham's Cave in Gibraltar, overlooking the Mediterranean, to as recently as 24,000 years ago3. "Eurasia is a big place and there doesn't seem to be any reason why populations of Neanderthals may not have survived somewhere," says Higham. Pinhasi, R., Higham, T. F. G., Golovanova, L. V. & Doronichev, V. B. Proc. Natl Acad. Sci. USA doi:10.1073/pnas.1018938108 (2011).